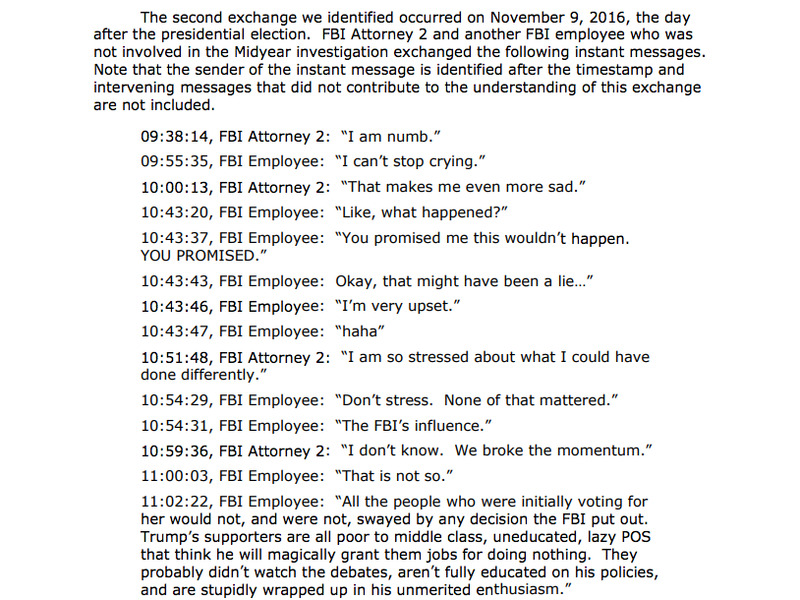 Instant messages between FBI employees assigned to the Hillary Clinton email probe reveal they worried about the investigation’s role in deciding the 2016 election. An internal report by the Department of Justice’s inspector general ultimately found no political bias in the investigation. In messages exchanged over the FBI’s internal system, agents and attorneys involved in the FBI’s 2016 investigation into Hillary Clinton’s use of a private email server insulted President Donald Trump’s supporters and partially blamed themselves for potentially swaying the election with their probe. The records of the messages were published in a report from the Department of Justice’s inspector general, which conducted an internal review of the FBI’s handling of the inquiry into the Clinton email investigation. A goal of the internal investigation was to discern whether or not political bias of the agents involved tainted the credibility of the probe. That day, FBI Director James Comey sent a letter to Congress announcing the re-opening of the Clinton probe just days before the 2016 election. Attorney 2 described the re-opening of the investigation so close to the election as “essentially walking into a landmine” in the report. 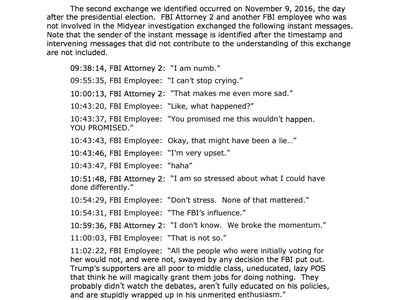 In messages exchanged on November 9, 2016 and documented starting on page 417 of the report, FBI Attorney 2 and other FBI employees discuss their distress over the results of the presidential election and insult Trump supporters. In the report, FBI Attorney 2 stated that these conversations were with people he considered friends, and he was discussing his political beliefs in an entirely personal capacity and not a professional one. He added that his political views did not in any way influence his work on the Clinton probe.